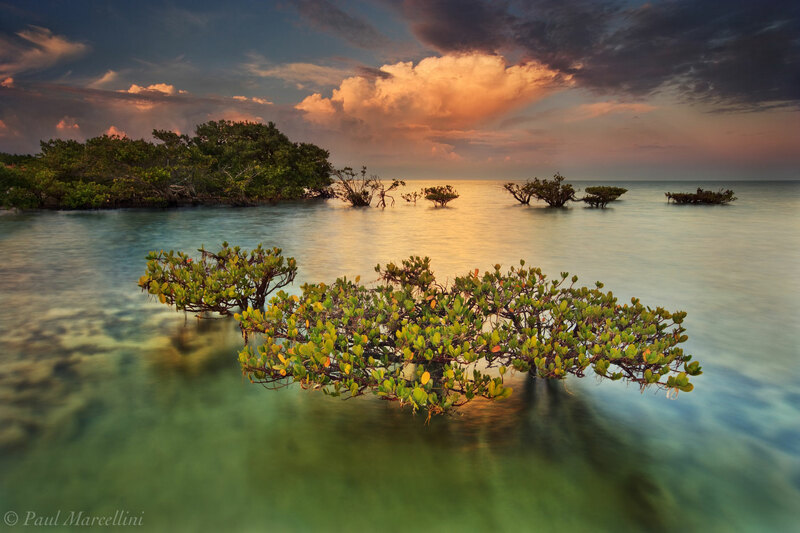 Mangroves are a vital part of tropical shoreline habitats. They stabilize the soils and prevent erosion, while also providing habitat for sea life. This special area of mangroves have been visibly dwarfed due to the hardships of growing out in the open. With nothing but the Atlantic ocean off to the east, these little mangroves are the first things many hurricanes hit. True survivors with the scars to prove it. In this image, a thunderstorm is building at sunset, catching the last of the day's light. This image won Grand Prize in Florida Wildlife Magazine's 2010 Photo Contest, was the 39th Annual South Miami Art Festival Poster and was published as a full page spread in Outdoor Photographer Magazine December 2011. Photo © copyright by Paul Marcellini. This print has sold out of Tier 1(#'s 11-30) and Tier 2(#'s 31- 50) and has entered it's third pricing structure for the edition. Tier 4 pricing will begin with #71.